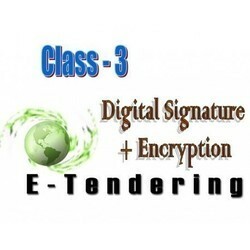 We are a prominent firm for providing Digital Signature Class 2 Service. We offer customized digital certificate service for all clients’ needs. These digital certificate services are provided by highly professionals in accordance with industry-specified quality standards. Apart from this, these services are offered reasonable rates. A Class 3 Digital Signature Service (DSS) is essential for companies and organizations that take part or intend to take part in eTendering processes on various Government sites. Besides enabling eTendering which is extremely convenient and transparent, a Digital Signature Certificate also ensures greater security in other online transactions. With the support of talented professionals, we are involved in providing highly effective Tender Digital Signature Service to our prestigious clients. The digital signature services offered by us are rendered professionally in compliance with the quality standards of the industry. Also, this digital signature service is available to us in many types at pocket-friendly rates. We are the leading organization to offer our precious clients an optimum quality Digital Signature Service. This service is carried out under the strict supervision of our experts using the best grade tools and advanced techniques. Our skilled professionals ensure the clients that the service, provided by us is highly reliable and executed in an excellent manner. The offered service is performed within a stipulated time-frame. Furthermore, this service can be availed by our precious clients at budget-friendly prices. Digital Signature Service is needed by a person who wants to participate in e-tender, E-auction etc in individual name and not in the name of the organization. 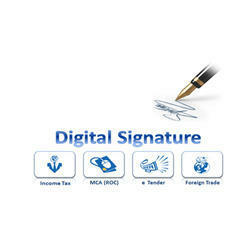 In India, under the concept of the Digital India, almost each and every government transactions are being made through digital signature. Digital signature usage in india many times encounter with various types of errors like “Invalid certification chain received” etc. We have dedicatedsupport team consisting of professionals to provide you the solution to the problems of the Digital Signature. Looking for Digital Signature Services ?